Reply 'To Mr Spalding Gordon',. 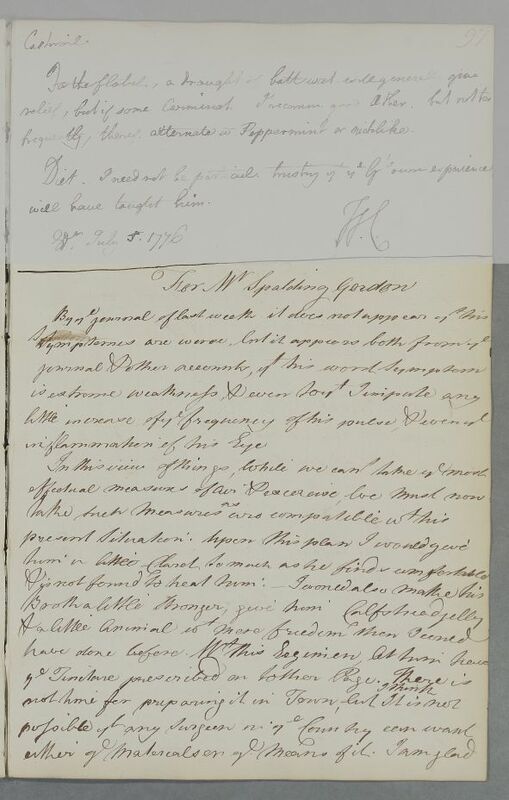 Advice for his physician [identified as Dr John Gilchrist of Dumfries] in response to Letter ID:1305 and its enclosures, as his symptoms seem to have become worse. Recipes include an eyewash. 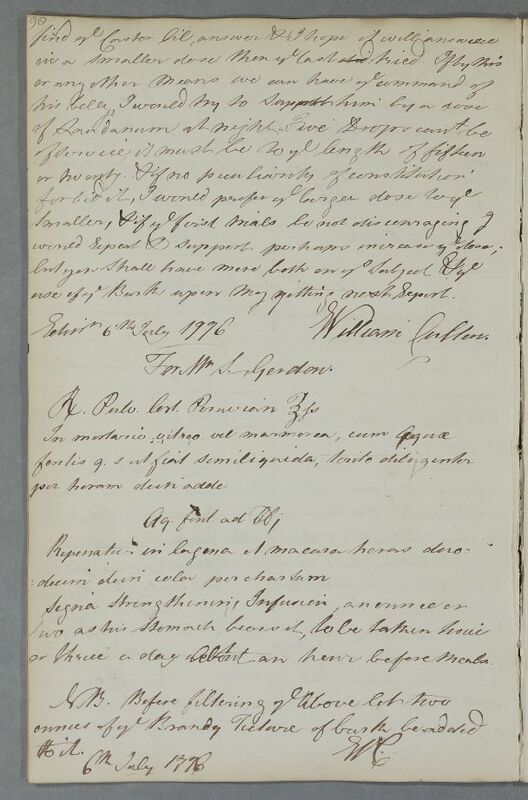 Summary Reply 'To Mr Spalding Gordon',. 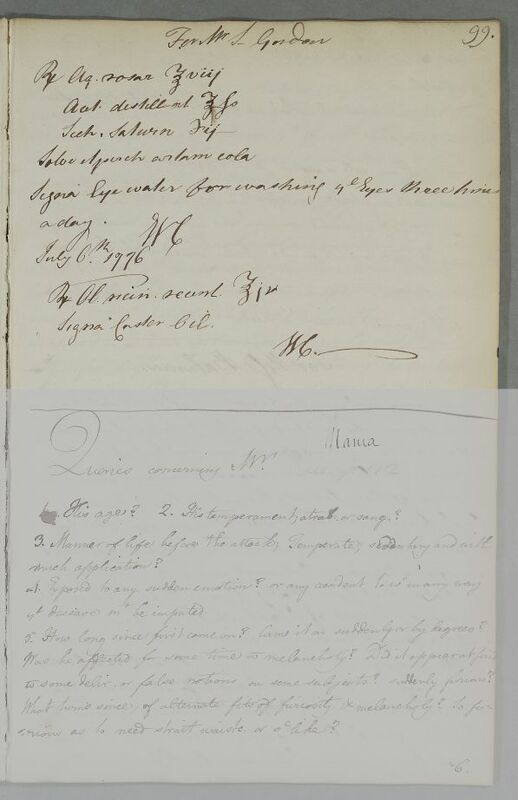 Advice for his physician [identified as Dr John Gilchrist of Dumfries] in response to Letter ID:1305 and its enclosures, as his symptoms seem to have become worse. Recipes include an eyewash. use of the Bark upon my getting next report. Take half an ounce of powdered Peruvian Bark. In a glass or marble mortar, mix thoroughly for an hour with enough spring water as to make semiliquid, then add up to a pint of spring water. Replace in flask, steep for 12 hours, then strain through paper. Label: Strengthening Infusion, an ounce or two as his stomach bears it, to be taken twice or thrice a day about an hour before meals. ℞ Take 8 ounces of Rosewater, half an ounce of Vinegar Distillate, and 2 scruples of Sugar of Lead. Dissolve and strain through paper. Label: Eye water for washing the Eyes three times a day. Take 4 ounces of fresh Castor Oil. Label: Castor Oil. use of ye Bark upon my getting next report. or thrice a day about an hour before meals.